This weekend will see some unique dancing in Oakland when Project Bandaloop takes over the Great Wall of Oakland. Have you ever seen such a sight as people dancing on the side of a building? Have you ever? This weekend, your wildest Dr. Seuss fantasy come come true when Project Bandaloop puts on a sideways, upside down, front side up and everything in between performance on the Great Wall of Oakland. The Project Bandaloop performers combine climbing techniques and technology with modern dance moves. 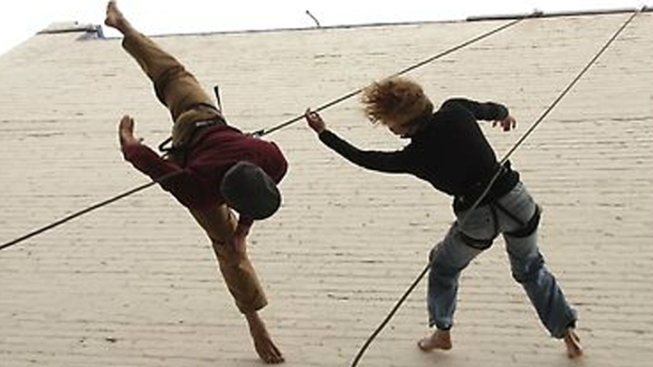 The catch is instead of dancing on a solid floor, the performers are suspended in air with ropes and harnesses and perform on the side of buildings. Friday and Saturday night at 6:30 p.m. and 11:30 p.m., the artists will perform on the Great Wall of Oakland, located at West Grand Avenue between Broadway and Valley Street. Viewing is free, unless you want to be fancy and reserve a seat. Viewers are asked to bring blankets and plenty of warms to share with the dancers.